December is the most popular time of the year to get engaged, thanks to festive decorations, champagne and lots of gatherings with family and friends. Start planning your special day at the Holiday World Show Dublin, taking place from Friday 22nd to Sunday 24th January 2016, to get the inside track on where to go and how to pay less for your honeymoon or wedding abroad. The annual Holiday World Show allows newlyweds and loved up couples the opportunity to plan their honeymoon or wedding abroad with confidence, offering a huge range of options. The Holiday World Show Dublin 2016 at the RDS Simmonscourt, Dublin is ‘the’ travel show to learn of new trends and ideas. With numerous ‘show only’ deals available, this is the ideal opportunity to book a honeymoon and see the world without breaking the bank. Models Baiba and Mathew at the Botanic Gardens in Glasnevin to launch this years Honeymoony Pavillion at Holiday World Show 2015 at the RDS which opens it’s doors to the public from 2pm on Friday Janurary 23rd until Sunday 25th, with over 1,000 travel experts from 50 different countries. From romantic trips to Rome to scenic home holidays, safaris in Africa to surfing in Bali, the experts are on hand to recommend the best honeymoon for you. The popular honeymoon destinations of Mexico and Jamaica will be present, as well as a host of top cruise companies! Or why not plan a truly romantic wedding by jetting off and marrying abroad in sunny Spain, on a beautiful beach in the Caribbean or up close with Africa’s wildlife. With over 50 countries represented, almost 1,000 travel and tourism professionals will be ready to give advice and detailed, expert information on how to make the most of a honeymoon and how to get the best value. Instead of trawling through endless confusing websites, the experts on hand at the show will be able to give one-to-one guidance and the information that visitors need to ensure a terrific and unforgettable honeymoon that’s best suited to them. Holiday World Show 2016 will again host the free Eoghan Corry Travel Summit in association with Dublin Airport facilitated by renowned travel journalist Eoghan Corry where leading industry experts will give talks and answer visitors’ questions on topics such as Cruises, Weddings Abroad, Safaris and Exotic Destinations, as well as Home Holidays. These informative and enjoyable seminars prove hugely popular with visitors every year. For up to date information on Holiday World Show 2016 see www.holidayworldshow.com . This August Bowe Travel Thurles have the ultimate in luxury travel with a 5* honeymoon package in beautiful Bali. If you’re looking for paradise on your honeymoon the Nusa Dua Beach hotel promises to deliver. The hotel has five a la carte restaurants, four bars, a private beach, a gym and spa, expansive gardens and four luxurious pools. Price includes flights, 9 nights B&B in a Deluxe room the Nusa Dua Beach Hotel, taxes and private return transfers. Offer available for travel in August 2014. For just €315pp guests can upgrade to a Palace Club Room which grants guests numerous special entitlements including access to the Palace Club Lounge, complimentary high tea every day, free wine and a butler! For any brides or grooms who are running a little behind with their honeymoon plans – Classic Resorts have the holiday for you. Available from 1st May – 22nd June this four star Maldives adventure with half board accommodation in a Beach Villa is the perfect start to your ‘happily ever after’. Following an unforgettable airport transfer via seaplane, all honeymooners will receive a complimentary fruit basket and bottle of wine on arrival. Optional upgrades include accommodation in a water villa for €165pp, or full board for €265pp. Newly wedded curious explorers will love this South African safari adventure from Travel Focus. The journey begins with flights from Ireland to South Africa, where, upon arrival, they will be transferred to their hotel in Cape Town for a four night B&B stay. When checking out of their Cape Town hotel guests will be given a complimentary car rental which they will use for the rest of their trip encompassing two nights B&B in the Winelands, two nights B&B on the Garden Route, and finally two nights full board accommodation at Eastern Cape Safari. At Eastern Cape Safari guests will be treated to a safari excursion in both the morning and the evening on both days of their stay. There are numerous additional activities which can be booked with Travel Focus ahead of the trip to customise your own bespoke dream honeymoon; additional activities will be at extra cost. 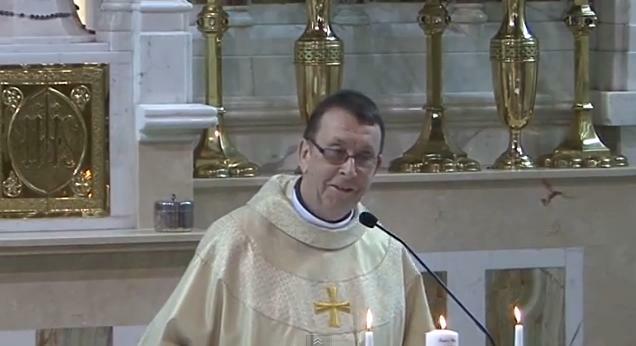 A Priest, Fr Ray Kelly, has surprised a whole Church full of people at the wedding ceremony of Chris and Leah O’Kane. That’s all I’ll say, as I don’t want to ruin the surprise. Watch the video below! Your wedding day – it’s supposed to be the biggest day of your life. But maybe it didn’t quite go to plan and instead went more down the pan. Did a storm scupper your marquee reception or a rogue page-boy create a ruckus in the church? Maybe the best man’s speech revealed too much detail about the ladsy stag. Did a key family member not make it to the ceremony, the rings go missing or the groom’s fly was down? Or perhaps your honeymoon turned into a five star disaster. Whatever your wedding day catastrophe, Tyrone Productions want to hear from you. They’re currently looking for married couples for a new show – ‘I Do…Take Two’ – in which married couples get to renew their wedding vows and right the wrongs from Big Day number one by doing it all again – but this time just how you dreamed it would be. No matter how long you’ve been married – be it one year or 50 years – make a big romantic gesture by getting in touch with them now. Email Robert with your wedding day disasters at weddings@tyroneproductions.ie with your name, phone number, where you’re from and how long you’ve been married. Ultimate Weddings Live in Association with FRANC comes to Kilkenny this October! The wedding show that should not be missed will be happening at The Hub, Kilkenny on Saturday 5th & Sunday 6th October! Meet FRANC, the name that is synonymous with everything stylish and individual in the wedding industry who will share his expertise and vision and help you make your day unique. Ultimate Weddings Live have also have brought together a host of local exhibitors who will professionally advise and assist you in planning and booking your entire wedding easily and stress free. With everything from reception venues and dresses to cars and favours, they have assembled all you could need under one roof to help you make your big day extra special. Ultimate Weddings Live events are action-packed days out with so much to interest a bride-and groom-to-be. Venues to menus, flowers, cakes, video and photographers – in just a few hours at Ultimate Weddings Live it is possible for you to book your whole wedding thanks to the fantastic selection of professional, affordable wedding vendors. Meet the people who’ll be supplying your wedding services face-to-face on the day, check out discounts and offers and quickly work out what the competition has to offer. For the busy couple, it’s stress-free, fun and a great day out. Relax and enjoy the Catwalk shows, starring models from the Andrea Roche Model Agency, which will be staged at 1.30 and 5.00 each day. All gowns and groomswear will be available from stockists exhibiting at the event. Be entertained and informed by “An Audience with Franc” from the main stage at 3.00 each day. Presale tickets can be booked on www.ultimateweddingslive.com for just €5 or you can pay €7 at the door. 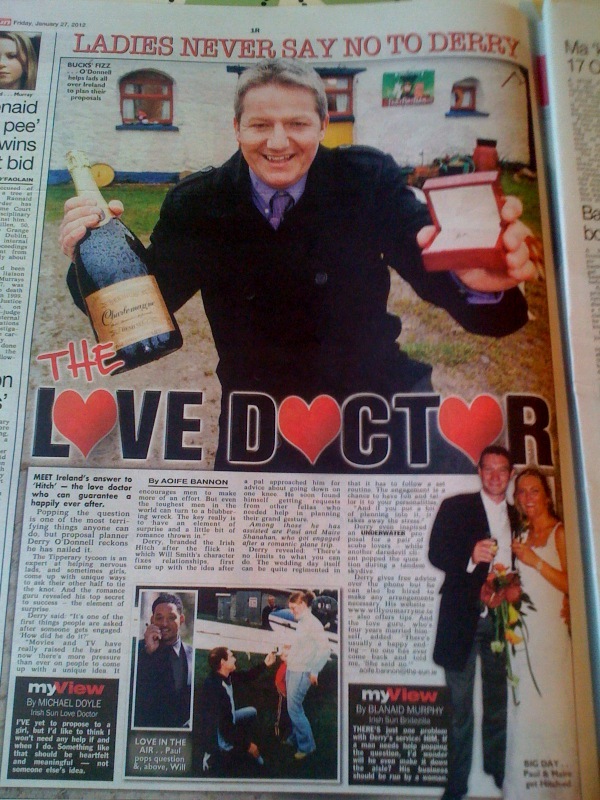 We got some great coverage in The Sun Newspaper for marriage proposal planning! A new survey has found that over 50 per cent of Irish brides say bad weather will disrupt their big day, with a third citing the likelihood of good weather in summer months as a major factor in choosing the time of year to get married in Ireland. The survey of over 230 Irish brides was conducted by one of Ireland’s top wedding venues, Dunboyne Castle Hotel & Spa, which, in response will launch its new ‘Rain or Shine’ offer at the hotel’s Wedding Fair on October 21st. The four star Dunboyne Castle Hotel’s new ‘Rain or Shine’ offer takes the stress out of Ireland’s typically bad weather for brides and grooms. If the sun shines, the bridal party can have their photography taken in the hotel’s picturesque tree-lined grounds. If the weather is not so good, photography can be taken in the hotel’s light-filled Castle Lounge and originally restored Dunboyne Mansion, with a romantic, candle-lit drinks reception. “We want to give people the wedding of their dreams and this survey is so useful in identifying that for an incredible 53 per cent of brides-to-be surveyed, bad weather is a real wedding worry” said Elisabet Diaz, General Manager of Dunboyne Castle Hotel & Spa. The survey also found that over half of respondents said the reputation of wedding venues was a primary factor in choosing a location, more specifically those with great surroundings and photo opportunities. Over 70 per cent choose the weekend to get married for guest’s convenience with Saturday being the most popular day. Dunboyne Castle Hotel and Spa’s Wedding Fair will feature everything the engaged couple needs to create their perfect wedding from the latest trend – providing guests with a gorgeous ‘pick n’ mix’ sweet selection – to wedding bands, DJ’s, décor and luxury cars. The room will also be dressed as a real wedding to give bridal parties a real sense of what their special day will look like. The Fair will also feature a Bridal fashion show of Ciara Roe bridal gowns as well as the perfect ‘Mother of the Bride’ outfits. To entertain visitors, there will be performances by wedding favourites The Halleluiah Gospel Choir and dancers, Celtic Fusion. All couples who book their wedding at Dunboyne Castle Hotel’s Wedding Fair will be given a complimentary overnight with breakfast at the hotel’s sister property, Dublin‘s five star boutique Dylan Hotel. Renowned for its friendly service, sweeping grounds and the beautiful décor of the original Dunboyne House, Dunboyne Castle Hotel & Spa offers couples the ideal wedding destination in the countryside, just minutes from Dublin. The bridal party and guests can also enjoy the hotel’s Ivy Brasserie and its award-winning Seoíd Spa, set over three floors with one of Ireland’s most extensive thermal treatment facilities. TV sensation Franc is the star of the show at Confetti Live! coming to Kilkenny’s The Hub this weekend, October 13th & 14th. Ireland’s sassiest, classiest wedding fair, Confetti Live! promises to be the most spectacular wedding event for brides and grooms-to-be in the Kilkenny region. Whether you’re engaged, have just popped the question or are deep in the organisation process, there’ll be something for everyone. Bring your bridesmaids, mum, dad and sisters – there’s something for everyone at Confetti Live! You can also expect to meet and chat with vendors and discover offers from a whole range of products and service suppliers including venues, food, favours and wine; bridal shops, dresses and grooms suiting; shoes, accessories and beauty; travel, honeymoons and weddings abroad; cars, wedding bands, DJs and soloists; plus pre-marriage courses and advice. Confetti Live! Kilkenny will also feature a number of live audiences with Franc each day, where he will dispense his words of advice and wisdom gleaned from his many years in the planning and organising of stylish, exclusive and exceptional weddings worldwide. Then relax and watch fantastic catwalk shows, professionally produced and staged, starring models from the Andrea Roche Model Agency, featuring gorgeous gowns available from stockists exhibiting at the show. Ahead of the event brides-to-be in the Kilkenny area have a fantastic opportunity to avail of discounted tickets to Confetti Live! if they book online before the event. Just visitwww.confettilive.ie to get yours now! This month destination wedding site MarryAbroad.co.uk has surveyed its UK couples database, and found that 40% of those choosing a wedding overseas already have children. And the site’s wedding planners, based in both long and short haul destinations, typically found that over 5 years, they have seen on average a 17% increase of couples with children or step-children, getting hitched. Joint Founder Steph Bishop perceives this trend, currently big in the wedding industry, to be especially suited to destination weddings – as couples often will combine their wedding with a family holiday. Bishop states: “We are seeing couples choose child-friendly resorts more and more often, and sometimes even combine their wedding with a christening event too”. Up to 80% of wedding couples staying at Sani Resort, Halkidiki, Greece, use the facilities of the kids club and crèche, according to Anna Wohlfart, Wedding Coordinator. And on the actual wedding day, many couples book a babysitter during their evening celebrations – giving them time to enjoy the event, in the knowledge their children are safe and sound. For example, it is best to avoid Thailand in the hottest months of April and May – when humidity is at its highest, when marrying with small children. In Southern Europe, avoid the heat of a hot summer’s day, and choose the morning or early evening for the ceremony. For long haul destination weddings, try if possible to arrive a week before the actual day, so that kids can acclimatise slowly and get over jet lag. Make sure children stay hydrated. Include lots of pool and beach time to keep them cool! Try to involve children with the ceremony as much as possible, as ring carriers and flower girls. Arrange a familiar feast for children, speaking to the wedding planner in advance to ensure children have food they will recognise on the day. And don’t forget the seating – wedding planners can also arrange for smaller seats, tables and high-chairs for kids. If children are dressing up; remember that heavy dresses or suits in a hot country can be uncomfortable. Thai wedding planner Creative Events Asia wedding found that this year, 15% of bookings were for couples remarrying, with older children. If taking teenagers away and it is within budget, let them take a friend along for company. Angelina Jolie is famously marrying a certain Mr Pitt this year, and reportedly has commissioned individually designed jewellery, for all of her six children – as keepsakes on their special day. Make like Angelina, and buy something a little special for children to give them at the ceremony, that will remind them of the wedding for years to come. Fireworks on the beach and lantern releasing, is always a huge hit with children! For more information, please visit www.MarryAbroad.co.uk or visit them on stand A54 at the National Wedding Show, Earls Court, London, 28-30 September 2012. TV sensation Franc is the star of the show at Confetti Live! coming to Kilkenny’s The Hub this October 13th & 14th. You can also expect to meet and chat with vendors and discover offers from a whole range of products and service suppliers including venues, food, favours and wine; bridal shops, dresses and grooms suiting; shoes, accessories and beauty; travel, honeymoons and weddings abroad; cars, wedding bands, DJs and soloists plus pre-marriage courses and advice. Ahead of the event brides-to-be in the Kilkenny area have a fantastic opportunity to avail of discounted tickets to Confetti Live! if they book online before the event. Just visit www.confettilive.ie to get yours now! Paul Cawley. on Planning an Irish wedding from the US?